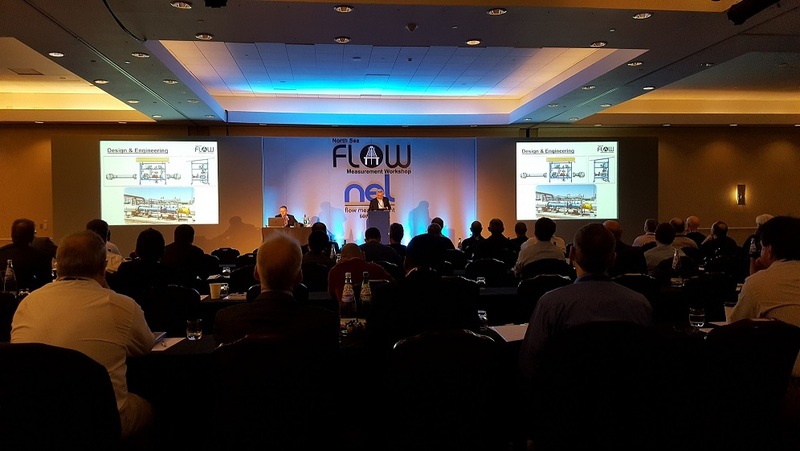 Petroleum Software Ltd is taking part in the MultiFlowMet II JIP which is coordinated by TUV NEL and supported by The European Metrology Programme for Innovation and Research – EMPIR. A number of leading MPFM suppliers and multiphase flow laboratories are taking part in the new JIP which is a follow up to the preceding EMRP project ENG58 at which a small reference network (of three laboratories) was established based on a single multiphase metering technology. 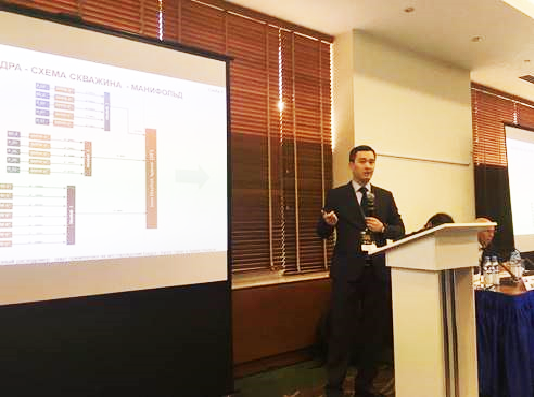 MultiFlowMet II will expand the reference network itself and incorporate a wider range of industrially-relevant flow conditions that are proven across a more representative range of field- deployed MPFM technologies. PSL has presented its latest multiphase flow meter model esmer D2+ at the Iran Oil Show (21st international Oil and Gas Show 5-8 May 2016). The show, held at an exhibition park at the center Tehran, was better attended this year. The lifting of the sanctions has given an uplift to the exhibition. We have noticed a larger number of international exhibitors this year. 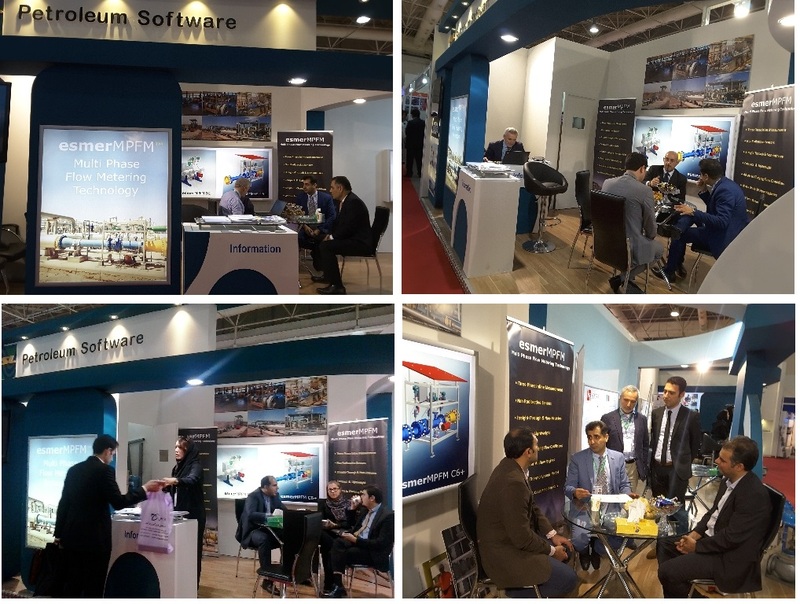 Discussions with NIOC engineers who have visited our stand have confirmed that projects which had stalled in recent years will be revived during 2016. Petroleum Software Ltd has gained BS EN ISO 9001:2008 certificate. 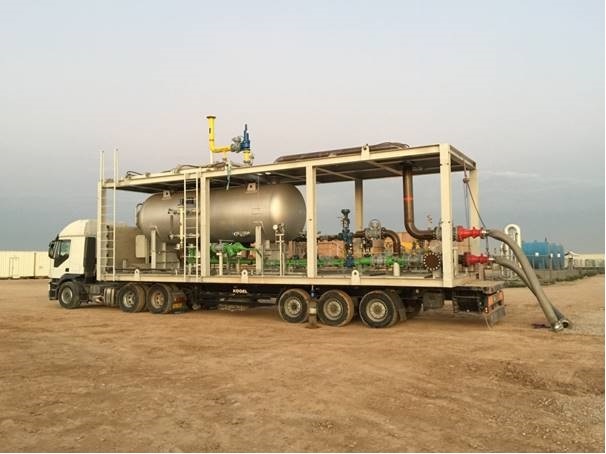 PSL engineers were at Badra Iraq at the beginning of February to validate the well head MPFMs (17 off) against a mobile 3-phase horizontal test separator. As with all measuring instruments, inline MPFMs need to be proven at intervals. In the case of MPFMs it is more practical to do the job in-situ and a conventional horizontal gravity separator is best suited for the task. Thus, the provision of a conventional separator was included in the project scope from the beginning at PSL’s initiative. According to the present project plan, the operator will take direct responsibility for use of the mobile separator for the validation and in-situ calibration of the MPFMs instead of relying on a third party well test service company as per usual practice. This would permit a regular test plan to be put in place. The separator, manufactured by China Oil HBP Science & Technology (http://www.china-hbp.com), was designed to handle maximum flow rates of up to 18,000 bpd /day of oil and 20mmscfd of gas at a maximum pressure of 43 bar and 120C. Care was taken for optimizing the size of the vessel to achieve mobility between 17 well heads. Despite such care, weight of the separator assembly is 38 tons empty / 57 tons’ full frame dimensions are: 12.5m (L) x 3.6m (W)x 6m (H)). A size worthy of attention but the lifting gear and the trucks were more than a match for the challenge. The separator was lined up in series with MPFMs and measurements were carried out simultaneously and compared. MPFMs were seen to be performing within design uncertainty limits. Readers of this column will be aware that PSL has delivered twenty ESMER MPFMs to Gazprom’s Badra Field since 2013. Drilling is ongoing at the field and MPFMs are being brought on line in stages as new wells are completed. Another MPFM has just been brought on line in December, bringing the total number of MPFMs commissioned to 7, still a little short of half way mark! esmer C2+ system was delivered to IOOC for installation on a new wellhead platform constructed within the scope of the Foroozan Field Development Project. The FOROOZAN complex is located in Iran and Saudi Arabia border, 110 KM from KHARG Island. ESMER C2+ MPFM will be used for well testing purposes. Further deliveries of esmers have been made to the Badra Oil field bringing the total supplied since October 2013 to 17 off 6” well head MPFMs and three off 14" production line MPFMs. The operator is Gazprom and contractor is CPPMec. >PKS is a start up Turkish company founded by Petroleum Software Ltd in 2012. PKS has a twofold mission; to conduct R&D and to provide field support for esmer users in Africa and the Middle East. Working from offices within the wide green spaces of the Technopark at Istanbul Technical University (ITU), PKS enjoys the campus life in full. A year after its foundation PKS already has in place a team of software, electronics, petroleum and mechanical engineering graduates who have passed an intensive training program to provide remote and field support services for esmers directly from Istanbul We are now only a few flying hours away from esmer's in Africa and the Middle East. The first batch of esmer C6+ (6") MPMs (three off) and esmer C14+ (14") MPFMs (two off) were delivered to Badra Oil Field in Iraq. The MPFMs will be used in well testing and production measurement in Badra Oil Field. The operator is Gazprom and contractor is CPPMec. We announce the launch of a new product. esmer GLCC is composed of gas/liquid cylindrical cyclone separator, passive level controller and conventional metering instruments. esmer GLCC can be used as a complimentary tool (for field calibration and validation of esmer in-line meters) or as a stand alon multiphase metering system in its own right. esmer C3+ mobile system was delivered to GNPOC Sudan. esmer C6+ fixed MPMs (two off) were delivered for an off-shore application in The Gulf. esmer WIO Meter measures the flow rates of individual phases in two-phase oil-water production lines which remain in the oil continuous phase (*). esmer WIO is based on a cone differential meter which also acts as a capacitance sensor. (*) esmer WIO measures oil-water mass flow rate as well as water composition. esmer WIO works in the range 0-50% water cut and can tolerate up to 5 % GVF within its accuracy specification. esmer WIO is particularly suitable for use in production lines and in the liquid leg of separators. Effect of oil density and temperature is taken into account in the factory calibration of the meter. Field measurements are automatically compensated for changes in oil density and temperature Salinity does not affect the measurement made by esmer WIO Meter – which is based on the characterisation of the dielectric property of the fluid. esmer WIO field unit makes two primary measurements which are combined in the flow computer to provide the oil flow rate in mass or volumetric units. The primary measurements are those of dielectric constant (water composition) and differential pressure across the cone (mass flow rate). Click for esmer Water-in-Oil Data Sheet. Do you feel that you are you paying too much for well testing services? Are you finding it difficult to operate and maintain a mobile separator? Are you finding it difficult to move around tons and tons of equipment? The meter hosted on the mobile skid can be any esmer selected from the usual range (2" to 6") and enjoys the same advantages of wide range and high accuracy of fixed meters. esmer are non-instrusive (no sand trapping problems) and non-nuclear (oil industry standard sensors). Petroleum Software has announced today that it has successfully commissioned esmer C3+ mobile multiphase flowmeter at an ONGC platform (VSEA) off Mumbai. Petroleum Software has announced today that it has successfully tested and delivered an esmer C3+ multiphase flowmeter to ONGC. esmer C3+ was shown to perform well within its performance specification at laboratory tests conducted at NEL. The meter will be used in mobile well testing in the Mumbai off-shore fields. Petroleum Software has announced today that it has successfully commissioned three esmer V2+ multiphase flowmeters at the Mala Extension field in Sudan operated by White Nile Petroleum Company (WNPOC). This brings the total number of esmers used by WNPOC in the Mala and neighbouring Thar Jath fields to ten. The first set of six meters installed at Thar Jath IN OCTOBER 2006 continue running successfully. esmer V6 is a six inch nominal diameter compact horizontal non-intrusive meter which comprises the usual complement of esmer sensors: venturi with recovery pressure measurement, capacitance and conductance sensors. Signal processing is carried out by the usual neural net based methodology on a Beckhoff microprocessor housed in an explosion proof enclosure mounted directly on the spool. Measurements are displayed locally and transmitted digitally by Modbus interface. The meter was tested at NEL in August 2006 (see below), delivered in Autumn 2006 and successfully commissioned in April 2007.
esmer V3 is a three inch nominal diameter compact horizontal non-intrusive meter which comprises the usual complement of esmer sensors: venturi with recovery pressure measurement, capacitance and conductance sensors. Signal processing is carried out by the usual neural net based methodology on a Beckhoff industrial PC housed in the control room. The meter was tested at NEL in August 2006 (see below), delivered in Autumn 2006 and successfully commissioned in April 2007. 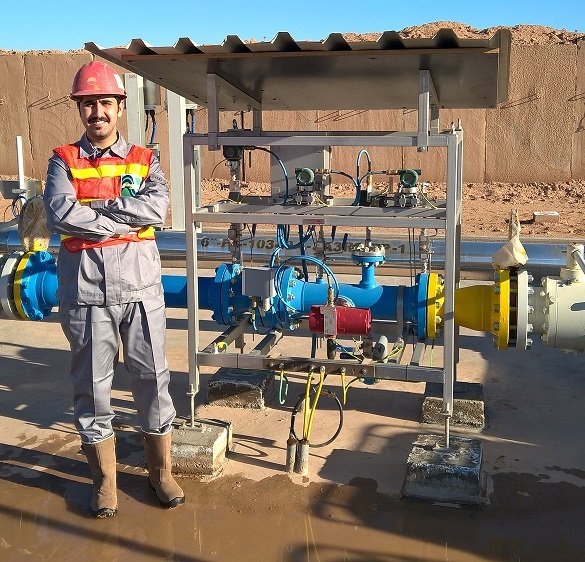 Petroleum Software has announced today that it has successfully commissioned six esmer V2 multiphase flowmeters at the Thar Jath oil field in Sudan operated by White Nile Petroleum Company (WNPOC). The meters were installed and made operational in May 2006 and have been running trouble free to date. With its robust straight through electromechanical design and state-of-the-art technology founded on simple sensors and neural net based software, esmer was an ideal fit for the new Thar Jath development which is located in the south of Sudan. esmer was a good fit for WNPOC's requirements for another reason; the operator wanted a flow meter which did not employ radioactive sensors. As part of the site acceptance testing well tests were conducted at each one of the six gathering stations where esmer meters of identical design are installed. A total of 24 wells were tested at intervals over a period of three months to date. It has been observed that the mass balance obtained from measurements carried out by six esmer meters agreed with the total production measured at the Central Processing Facility to within 10% despite the fact that there were large variations in total production over this period. It is also worth noting that this accuracy was achieved without any tuning or adjustments to the factory calibration of the meters. Siemens has awarded a technology licence to Petroleum Software Ltd for manufacturing flow through electrode capacitance sensors based on active shield technology developed by Siemens. The technology is particularly suitable for use in multiphase measurement applications due to its fast response times. esmer neural nets use features extracted from the capacitance electrodes at high frequencies to determine water composition in the presence of gas across the full GVF and water composition range. The performance of esmer V6 (6") multiphase meter was evaluated by NEL in the course of an acceptance test commisioned by the prospective user (Sabah Shell Petroleum Malaysia). Sixteen measurement points were taken in the gas flow range 300 to 900 m3/hr and with liquid loading from 1 to 19% (v/v). The rms error for liquid and gas flow rates measurement was observed to be less than 5% of reference measurements and the system was accepted by the customer being well within its performance specification. The performance of esmer V3 (3") multiphase meter was evaluated by NEL in the course of an acceptance test commisioned by the prospective user (White Nile Petroleum Company Sudan). Twentyeight measurement points were taken across 55 - 90% GVF and 0 - 90% water cut with liquid flow rate varying from 2000 to 10000 bpd. The rms error for liquid and gas flow rates and water composition measurement was observed to be less than 5% of reference measurements the system was accepted by the customer being well within its performance specification. Petroleum Software Ltd has announced today that after a tightly fought contest between leading suppliers, WNPOC / Muhibbah (Malaysia) today have announced that Petroleum Software Ltd has been selected to supply a flow meter of type esmer V3 for the new field development which will go into production in April 2006. Background to the Sudan and Thar Jath and Mala field developments were published in the Gulf Oil and Gas Journal. See also recent news from Sudan Tribune. esmer T2 was successfully commissioned on the SFJT-C satellite platform today. is located in the South China Sea, offshore Kota Belud, Sabah, Malaysia. SFJT-C is an unmanned platform operating in accordance with minimum intervention with remote operation facilities concept. esmer T2 was supplied as an upgrade for esmer T3, running since November 2002. The new meter can be controlled and calibrated remotely without the need for any manual intervention and is tailored for the high gas lift wells producing on this platform. esmer T2 contains a new design feature enhancing its accuracy through interpretation of the recovery pressure characteristics downstream of the differential device. The new design was tested successfully at NEL recently. After a tightly fought contest between leading suppliers, Sabah Shell Petroleum today have announced that Petroleum Software has been selected to supply a six inch non-radioactive flow meter of type esmer V6 for installation on SFJT-E satellite platform , a field located in the South China Sea, offshore Kota Belud, Sabah, Malaysia. SFJT-E will be an unmanned platform in line with minimum intervention with remote operation facilities concept. During Phase 1 of the project there will be eight production wells and gas lift will be supplied via the neighbouring SFJT-B platform. MPM shall be designed to measure bulk maximum and minimum from the production well flowlines as well as the flows from a single well string under test in line with Test Separator. Thus a wide turn-down ratio is required from the meter. This is the second esmer supplied to Shell Sabah by Petroleum Software. esmer T3 has been running on the SFJT-C platform since November 2002.
esmer V2 non-radioactive in-line flow meter was tested at NEL in January before the delivery of a batch of six meters to Sudan Thar Jath field (see below). The NEL test was conducted under a wide range of conditions. The tests were observed by three representatives from OGP, Muhibbah and WNPOC. 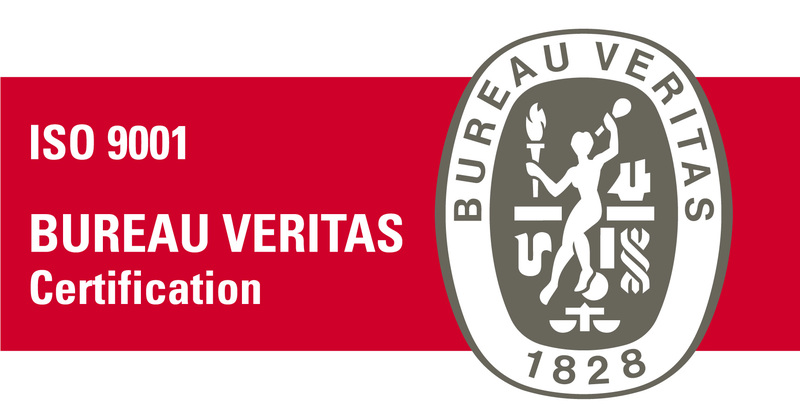 The test report written by NEL showed that the meter was within the stringent performance requirements of the end user. Petroleum Software Ltd has announced today that after a tightly fought contest between leading suppliers, WNPOC / Muhibbah (Malaysia) today have announced that Petroleum Software Ltd has been selected to supply six flow meters of type esmer V2 for the new field development which will go into production in April 2006. Background to the Sudan and Thar Jath field developments were published in the Gulf Oil and Gas Journal. Petroleum Software Ltd has announced today that the esmer T2 multiphase flow meter has started live use at the Java Sea off-shore platform KE40 operated by KODECO CNOOC. esmer is presently connected to two wells. The contract to supply the multiphase meter was awarded after a competitive tender. Kodeco's selection was influenced by esmer’s advanced technology based on non-radioactive sensors and signal processing with neural nets. Another strength of the esmer system is its remote access and control capabilities. For instance, the calibration of esmer systems can be updated remotely against well tests without platform visits. Petroleum Software Ltd has announced today that the esmer T2 multiphase flow meter has started live use at the on-shore Sukowati Field Development Project (East Java – Indonesia) operated by PetroChina. The performance of the meter was tested against a mobile test separator for a period of 6 weeks before PetroChina’s decision to go live on the multiphase meter. esmer is presently connected to two wells producing around 2000 to 5000 bpd at a GVF of around 85%. The contract to supply the multiphase meter for the Sukowati field was awarded after a competitive tender. PetroChina’s selection was influenced by esmer’s advanced technology which relies on robust sensors and signal processing with neural nets. esmer systems are not encumbered by radioactive sensors or intrusive mixers. Another strength of the esmer system is its remote access and control capabilities. For instance, the calibration of esmer systems can be updated remotely against well tests without the necessity for platform visits by maintenance staff. The meter was commissioned by PSL engineers as a turn-key system in July 2004 within six weeks of the purchase order. The meter comprises a field flow computer housed in an ex-d box connected to the control room and the company network which is 200 meters away from the flow line via an Ethernet cable. All commissioning work was undertaken by PSL engineers. Petroleum Software Ltd has announced today that the esmer V2 multiphase flow meter has been selected by Kodeco Energy Co. Ltd for use on a minimum facilities off-shore platform to be commissioned by the operator in the third quarter of 2004. KODECO Energy Co. Ltd. (KODECO), a PS Contractor of BPMigas and the operator of Poleng, KE-23, KE-5 and KE-2 fields Offshore West Madura, has discovered Oil at the KE-40 contract area about 12 kilometers from KE5 (CPP) area. This reservoir is to be developed as a 'Marginal Field' by installing a Minimum Facilities Platform for a maximum of 7 producing wells and with modifications to the existing KE-5 Central Processing Platform (CPP) facilities to accommodate a minimum of 6,000 BPD Oil, 3,000 BPD Water and 30 MMSCFD Gas. The design of KE-40 shall be for a stand-alone, normally unmanned, minimum facilities braced monopod structure. The contract to supply the multiphase meter for KE-40 was awarded after a competitive tender which brought esmer into competition with systems offered by Schlumberger and Roxar. Kodeco's selection was influenced by esmer's advanced technology which relies on robust sensors and signal processing with neural nets. esmer systems are not encumbered by radioactive sensors or intrusive mixers. Another strength of the esmer system is its remote access and control capabilities. For instance, the calibration of esmer systems can be updated remotely against well tests without the necessity for platform visits by maintenance staff. Petroleum Software has announced today that the esmer T3 multiphase flowmeter has been commissioned successfully at a Sabah offshore platform of the Sabah Shell Petroleum Company Ltd (SSPC - Malaysia). esmer T3 meter fits in with the "smart field" project of SSPC which is led by Dr Dasline Sinta. With its compact size and state-of-the-art technology founded on simple sensors and neural net based software, esmer was an ideal fit for the slim platform. SSPC also wanted a flow meter which did not employ radioactive sensors. In early field tests conducted after commissioning, it has been observed that liquid flow rates measured on-line by the esmer system agreed within +/-5% of the test separator and gas flowrates agreed within +/- 5-10%. Low watercut readings (1-3%) detected by the meter were undetected visually in the manual samples. The esmer multiphase flowmeter has been connected into the Shell computer network and being monitored from an onshore production control centre some 200 km away.